HTML Help is the new help format introduced by Microsoft with Windows 98. Help files in this format use the .CHM extension. It is supported by Windows 98, ME, 2000, XP, Vista, 7, 8, 8.1, and 10. The name "HTML Help" comes from the fact that the help files are built from HTML text while WinHelp files are built from RTF text. WinHelp is the name of the common help system that was introduced with Windows 3.0. 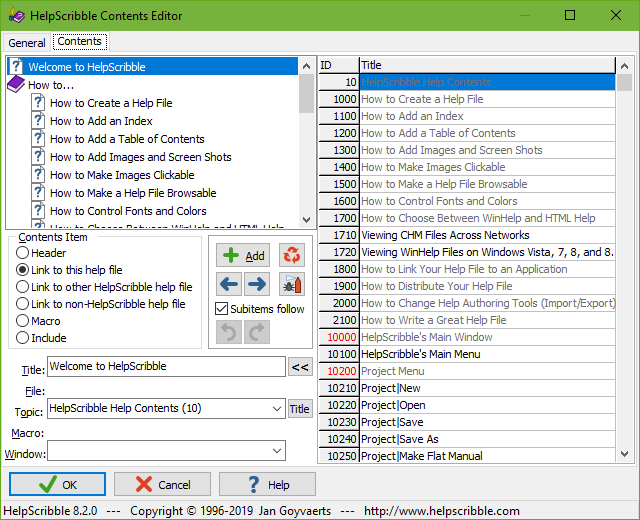 With HelpScribble, you can easily create help files in both formats from a single HelpScribble project. HTML Help is the help system used by Microsoft's .NET (dot net) framework. If you need to create a help file that will be used to provide context-sensitive help with a .NET application, HTML Help is your only choice. HTML Help is currently the recommended help format for Windows applications. It displays the table of contents or index side by side with the topic text, in the two-pane format that users are now familiar with. Windows Vista, 7, 8, 8.1, and 10 support HTML Help out of the box, while WinHelp only works after the user downloads the WinHelp viewer from Microsoft. The only problem with HTML Help is that CHM files cannot be opened via the network. This is a Microsoft security restriction, not an issue with HelpScribble. With HelpScribble, you can choose which help format you want to use. And you can change your mind at any time, in both directions. You do not have to make any special changes to your help project to use either format. Simply make another choice in Project Options, and recompile your project. HelpScribble takes care of all the technical details. 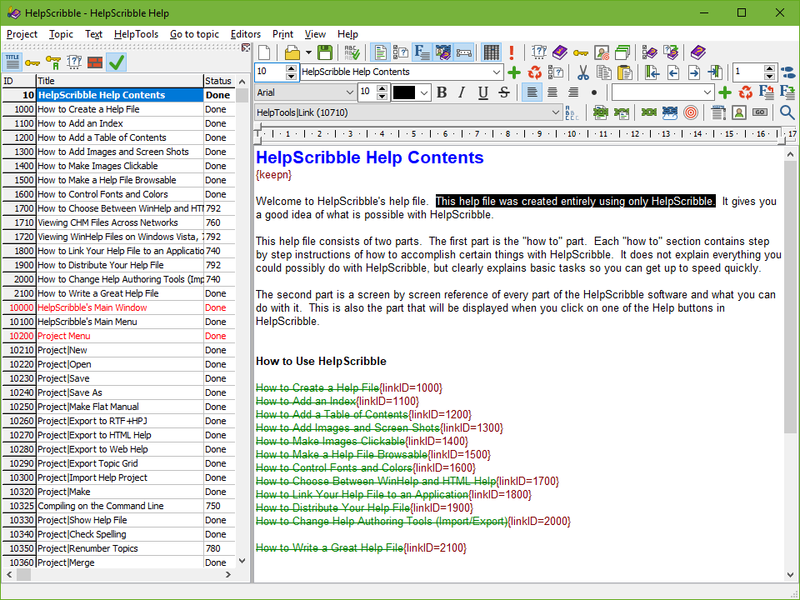 When you download HelpScribble, you will see that we included its help file in both WinHelp and HTML Help format. You can easily build the table of contents of your help file using the built-in Contents Editor. Click on the "Header" radio button, type in the "Title" and click the add button (green plus sign) to add a header. Adding topics is even easier. Simply double-click on them in the list showing all the topics in your help file. HelpScribble will automatically build the index for your help file. All you have to do is specify the appropriate keywords for each topic. You can do this directly in the topic grid in HelpScribble's main window, or by using HelpScribble's convenient Index Editor.